I am creating this Fund Raiser seek financial aid for my friend Nagabhushan & Deepa's son Sagar, who has been detected with a rare condition - Acute Pancreatitis. He is currently in Critical condition fighting for his life. Sagar is just 11 years old and has no prior medical history whatsoever. Last week Wed morning, he suddenly woke up in the morning with Severe Stomach pain. He was rushed to the hospital (Sriram Hospital in Hanumanthanagar), where the preliminary investigation revealed damage to the Pancreas. 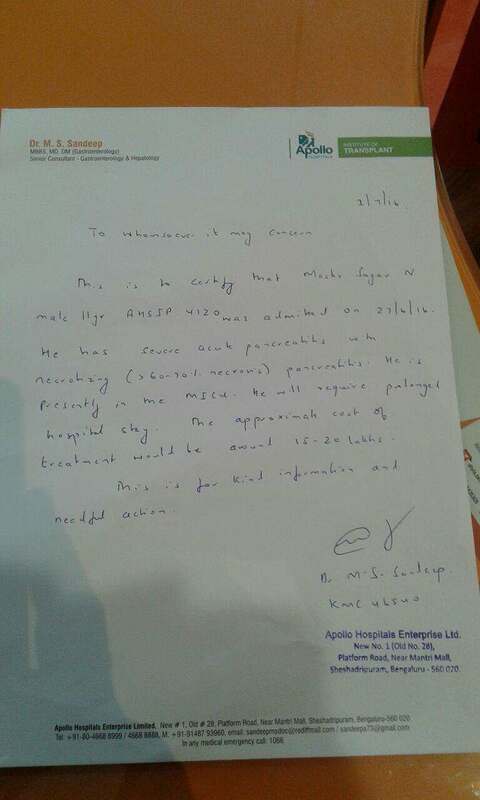 Since that hospital did not have ICU facilities, he was referred to the Apollo Hospital (Sheshadripuram) where he's in CICU for the past 5 days (since Jun 26th). After CT Scans doctors have confirmed that Sagar has Acute Pancreatitis and his Pancreas have been damaged by almost 70%. The case is currently further complicated due to internal bleeding. Doctors have advised he needs to remain in ICU for any possible treatment which may be for a period of more than 30-40 days. The avg cost is working out to about Rs 40,000 per day and Doctors are saying it may cost upwards of 20 Lacs for the treatment. Sagar is a fighter and is fighting hard for his life. Unfortunately Nagabhushan recently lost his job and had setup a Provision store to manage his livelihood just last month and this incident happened. Deepa currently has a 3 Lac insurance which includes the boy and Nagabhushan has arranged for an additional 2 lacs. But, they are severely short of finances to continue the boy's treatment (At least Rs 15 Lacs short). Would appreciate if you could post it for your friends to see and help too.. Thanks a ton for your help in advance. The Most awaited News. Sagar has been discharged. He's fully recovered and has gone back Home now. Thanks to all your prayers, wishes and Support. 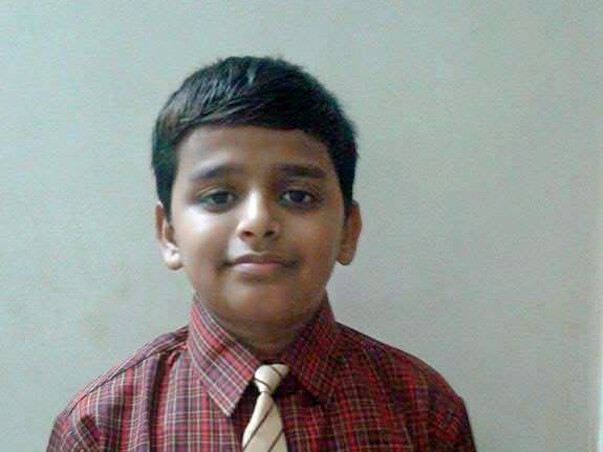 Sagar's parents Nagabhushana and Deepa cannot Thank u enough for all the help extended. Felt awesome when I saw this pic yest. Apparently the entire Apollo Hospital staff came to take pics with Sagar, as they have "Never Seen" another case like Sagar's. Most importantly as Case where everyone fought hard and ended up Victorius - Yippeeee!!! !